In 2-quart saucepan, heat wine, lemon juice and shallots to boiling over medium-high heat. Boil uncovered 4 minutes, stirring occasionally, until liquid is reduced by half. Add whipping cream to pan and heat to boiling, stirring occasionally. Boil uncovered 6 minutes, stirring occasionally, until sauce is thickened and reduced to about 1/2 cup. Remove from heat and add lemon peel. Beat in butter, 1 piece at a time, with wire whisk, adding the next piece only after the first has been completely beaten in and melted. When all of the butter has been beaten in, add 1/4 teaspoon salt and the white pepper. Cover to keep warm. Sprinkle fish with 1/4 teaspoon salt; set aside. In 12-inch skillet (preferably nonstick), heat oil over medium-high heat until shimmering and hot. Add fish and cook 3 minutes. Flip and cook 3 minutes longer or until edges begin to brown and fish flakes easily with fork. 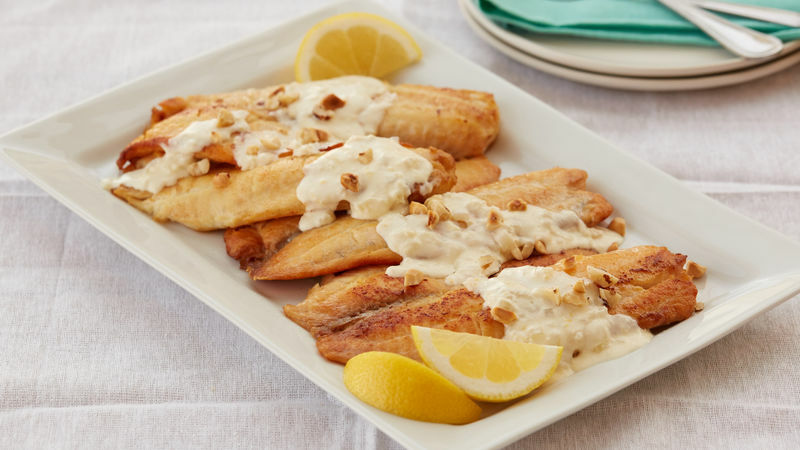 To serve, spoon sauce over fish and sprinkle with nuts.